TI Shielding Digest: Forearms, Thighs, Shoulders, and more…. My first main installment on TI shielding can be seen here. I cover the basics in head shielding, body shielding and how to shield at night. Here I want to talk about additional approaches to guard your body. One area that can be challenging to shield for TI’s are forearms. Perpetrators use Directed Energy Weapons (DEW) to weaken the body’s muscles and damage tissue. A favorite spot to target are the forearms because it limits the TI ability to type and otherwise share information via the Internet. Under attack, typing becomes arduous. I personally feel forearm DEW fatigue at times. It just so happens the most when I’m typing about TI phenomena- that seems awfully coincidental to me. It’s not carpal tunnel. CT is primarily felt in the hands (not forearms). And it’s a completely different sensation; speaking as someone who’s had carpal tunnel and worked with ergonomic specialists to deal with it. The DEW pain is usually a dull lactic-acid type feeling in your forearms- a chronic fatigue and soreness. In my prior writeup, I talked about the benefit of lead vest shielding. While that covers the torso and chest, it leaves the arms exposed. That lead vest shielding uses 0.35 mm lead; which is fairly heavy. Thats too much for your forearms given how much you use them. I tried creating makeshift forearm shields from the dental lead vest- that was lighter at about 1.4 lbs- too heavy causing my forearms to become sore when I typed. When I came across XGuard Radiation Reducing Sleeves, I was doubtful. It claimed equivalent of 0.3 mm pb (lead) protection but was made of natural rubber. I know from experience just trying to shield with anything convenient nearby usually doesn’t work. And to date I’ve mainly had success with lead and other metals. When I got these in the mail, they appeared fairly thin. They are 0.14 lbs each- 10 times lighter than their lead forearm shielding counterparts. I put them on and at first had to sort out the fact that they were a bit tight and compressed my forearms cutting off some blood flow (I put them around large jars to stretch them out overnight). After, I tested them out for one day. My findings? They actually work. I would describe their effectiveness at shielding at 50–60%. They significant reduce the forearm DEW fatigue I get the keeps me from typing (or causes me to make lots of typing mistakes from the fatigue). They are light enough to wear them and go about your day; not slowing you down as would be the case if you had lead rubber shielding. They are best to wear over a long-sleeved shirt. If you wear them directly against your skin, it gets very warm. You will sweat a lot. The rubber sleeves are a bit tight. I originally ordered Medium and have now ordered Large as they will fit better over my long-sleeve shirt sleeves. You can always stretch them out like I did by putting them around a few large jars. Even if you wear over fabric, somehow they will condense on the inside, so you will want to clean them regularly. You can wear a long-sleeved collared shirt or the like over the rubber sleeves and they will be unnoticeable to others. I feel fortunate to discover these ZZ Medical rubber sleeves. The lead rubber approach was not working for the forearms. I should say these sleeves do not remove the problem entirely- the way the lead calf sleeves do for example. They are 20x lighter so there are some tradeoffs. I want to forewarn you because you may think these sleeves will end the DEW fatigue altogether, but it mostly improves things. One note: the EMF weapons they use appear to slowly but surely weaken muscles over time. Shielding is vital to reduce the impact on your body and keep it functioning properly. Even after you begin shielding, there is often already cumulative damage so while you may feel some immediate relief, overall recovery will take time. I keep the rubber sleeves on much of the day and when I sleep. 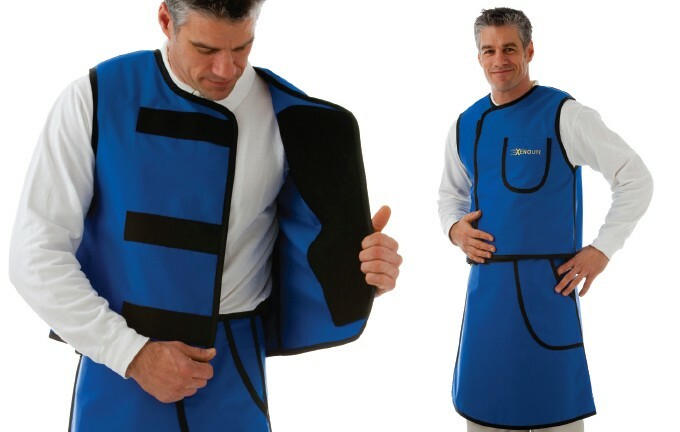 You may have seen my review of Xenolite lightweight lead aprons. In it, I talk about a frontal-only apron that covers the front of the body. After this, I also made another purchase from Xenolite- this time for a 2-sided vest and skirt called a “full wrap”. You can see this product here. So there is the part of the “frontal wrap” vest now protecting my back as well- which I believe is a big help even if the vest is about 5 pounds heavier (9 lbs versus 4 for the frontal vest). I always sleep with the 2-sided vest. But my main focus in this section is to talk about Thigh protection. You can see the “skirt” in the picture above- it is a separate piece from the vest. I’m just going to call it “shorts’ instead of skirt :) . The shorts are a bit of a pain. There is a massive velcro strap that you use to fasten it to your body. This never tightens enough, cannot be adjusted easily (without removing it entirely and trying again), and is exhausting to un-velcro to take off or adjust. It also has a belt with a clasp you can use in addition to tighten. I find these shorts cumbersome to wear (they overlap which adds protection but is clunky to walk with). They are heavy and they don’t fit well. These are personal observations- you may have better luck with them. However, the shielding does work for DEW to the thighs. Like the vest, these offer ~0.35 mm pb protection (in front) and 0.25 mm pb (in back). I wear the Xenolite shorts at night. That way if it doesn’t fit too tightly, it’s okay. I’m not moving around too much in bed. So they fit fine and protect my thighs, front and back. An extra bonus is that the shorts — unwrapped — serve as a 5 feet long lead rubber blanket you can use to cover your body like a blanket if you choose to use it that way. My satisfaction with the Xenolite shorts is moderate. As mentioned I don’t find it easy to use by day, but it works great at night/sleeping. I will also be testing soon a full-length 2-sided Xenolite apron that is long enough it will cover my thighs and see if it that’s easier to wear around during the day (as the weight will be supported in that case with the shoulders which may work better than trying to use velcro and having it rest on hips). I will report back on how that works. Organ discomfort. I believe the organs can be targeted by DEW through the back. Anecdotally, I’ve found that with the frontal-only vest, I still sometimes get this vague discomfort in my midsection that is either caused by organs being hit by DEW or overall inflammation in the area caused also by DEW. This lessens when I wear the “full wrap” vest. 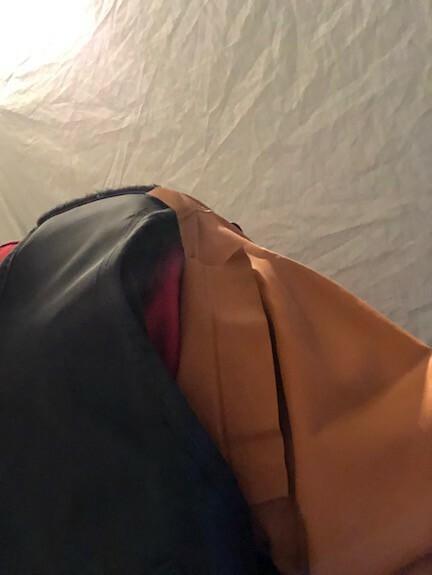 Update December 2018: I now use a makeshift solution by making modifications to the XGuard rubber sleeeve so it covers my shoulders (and upper arm). 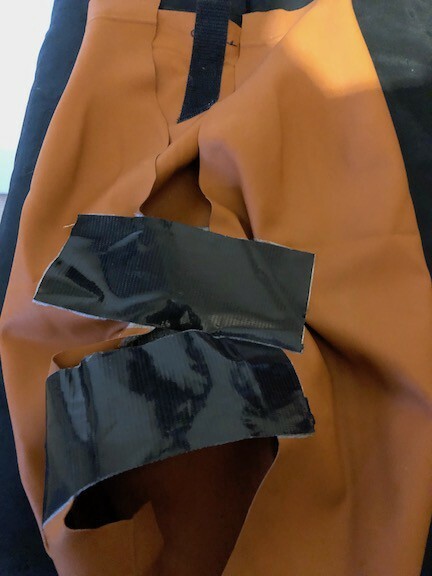 What I decided to do was use the XGuard Radiation Reducing Sleeves (shown further up the article) — made of rubber- and cut them open (and then tape them), to make them wider so they would cover my shoulders. These are super light. I add an industrial-strength velcro strip to the shoulders of my lead vest and one of the other kind to the inside of the rubber shoulder sleeve- that keeps it in place. 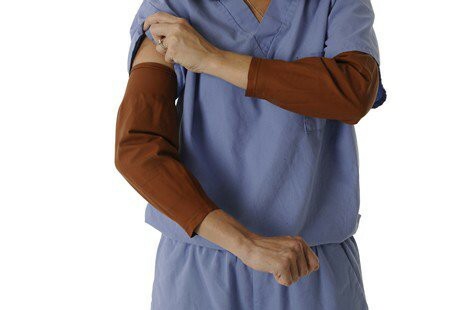 They do the job in terms of covering the shoulders and upper arm and seem sufficient to shield against the DEW I’m being hit with. To make sense of the above picture, I am standing off camera wearing a red shirt with a black lead vest on top of it. You see the orange rubber sleeve attached at the top with velcro to velcro. It stays in place and covers my shoulder and upper arm. (It is not perfect- you can see some of my red shirt exposed; I could add more velcro to attach it more completely, but right now it works fine for me). Context: I’ve found most lead-based solution for shoulders too heavy. The lead-alt sleeves from InFab were close- significantly lighter than SchureMed (referenced below) but still caused some soreness to my shoulders overnight from the weight. The Rubber sleeve does the job and weighs maybe 50x less! I’m still looking for solutions. I believe some medical vendors make this shoulder shielding with lead substitutes which tend to be lighter in weight. That may be less heavy and worth a try. Getting microwaved in your junk will have negative effects. Men may experience erectile dysfunction or partial ED. I tested out two products: Shield boxer briefs and Spartan boxer briefs. Bear in mind, I recommended Shield’s ballcap for head shielding. However, their boxer briefs didn’t seem to work. Too tight. Usually Medium fits fine. These were too small. And they were way too small if you wear them over your ordinary boxer briefs (my preference with shielding where they sew the metal directly into the fabric, like they do here, is to not let it touch my skin directly). Even the Large size doesn’t fit over well. They don’t seem to work. Without going into explicit detail, I didn’t see any measurable improvement versus not wearing these at all. There was virtually no effect. I was a little surprised since Shield’s headwear works so well. It’s a new product, so perhaps they have work ahead of them. The Shield briefs cost $41/pair. I purchased also the Spartan boxer briefs. These actually work. I have been waiting for something like this for a while. They fit really well; even a size Medium fits over my existing boxers fine and leave enough room. Unfortunately microwave targeting causes all kinds of symptoms; some you don’t realize it’s responsible for until after you’ve exhausted other possible causes. I hadn’t heard of Spartan earlier. And to be honest, I wasn’t even sure my diagnosis was correct that it was the frequency attacks that were causing the problem. But after using these for a few days, its clear it helps. They are a bit pricey at $45 a pair. The last point I wanted to make in this guide: Sometimes you will get so tired, you don’t want to wear shielding. Don’t fall into this trap because it builds on itself. You get so exhausted because you forget to put your shielding back on, let’s say, after stepping outside to grab lunch. Then you get weakened during the day. Then at night, you are too tired to put on your vest or calf/forearm shielding when you sleep. Then the next morning, you are too tired to….. You get the picture. The shielding adds some weight and requires some strength to endure; the more you wear it though, the more you’ll preserve your strength. Try to be diligent about wearing it. I'm a Bitcoin and Alt-coin investor based in the Bay Area. Started investing in crypto in 2015; focused on ICO investing.